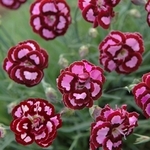 Dianthus 'Apple Slice'. These fragrant, intricately patterned, deep velvety red, 1.5" double blossoms have pale pink to white blotches in the center of each petal with a matching narrow picotee edge. They are presented on 10" tall wiry stems above a grassy mound of glaucous blue-green, grassy foliage. PP#21842. Deer resistant, low maintenance and drought tolerant, attracts butterflies, fragrant, cute cut flower—what more could one want in a perennial?. Pinks.